Oh, what a busy, work-filled weekend! 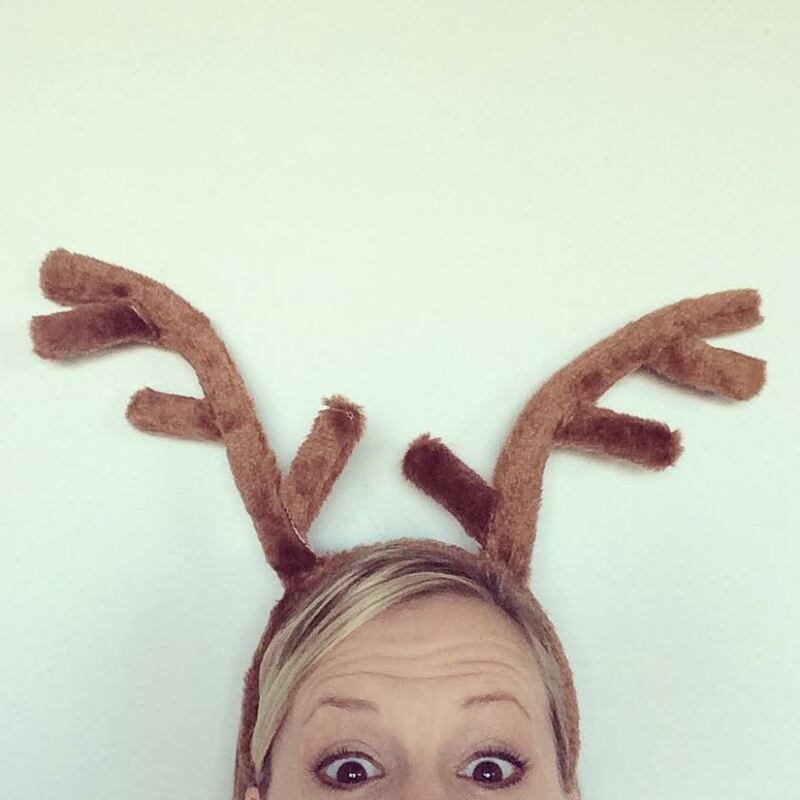 It started with welcoming Rudolph to town at one of our quarterly donor events — everyone in Atlanta should go see this amazing puppet show based on the classic television special. It’s phenomenal. 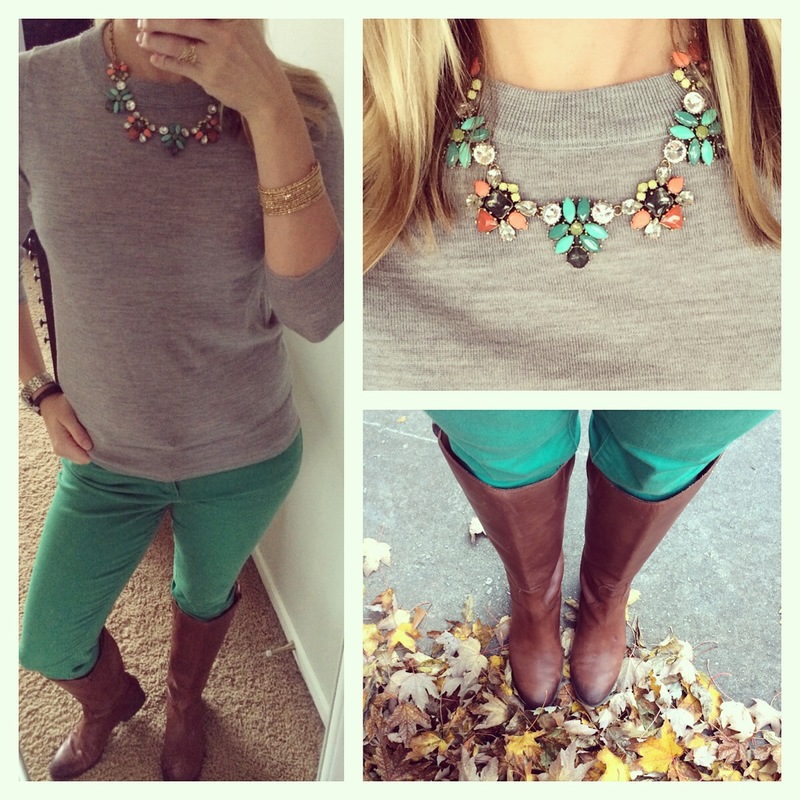 Saturday was jam-packed with photo sessions (4 of them all over town! ), but it was so fun, as all of them were for friends of ours. We finished off the night with a fun pizza and football dinner with a few friends over in Emory Village. 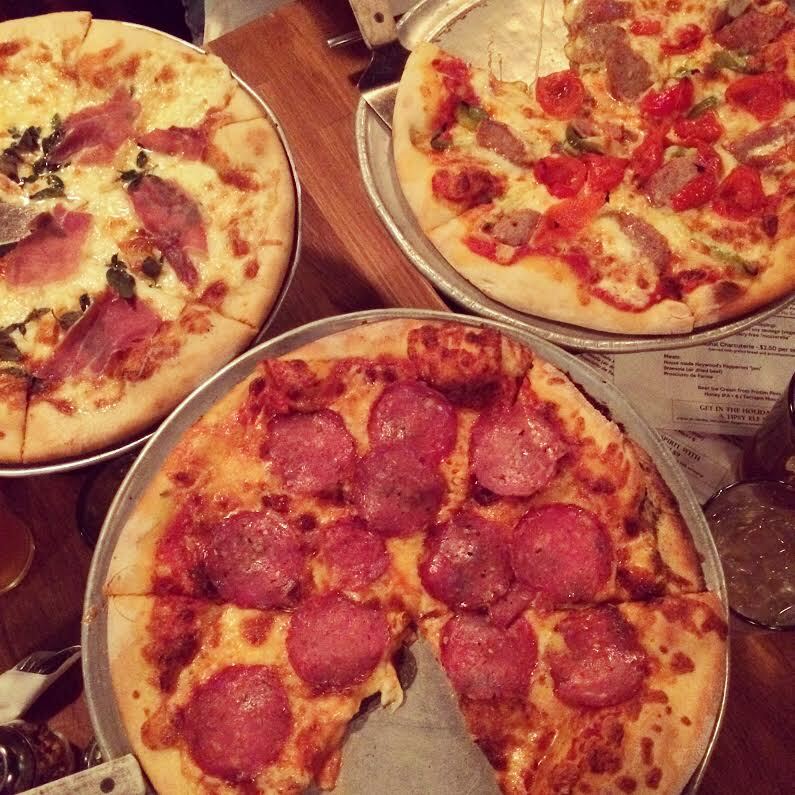 Good friends + good beer + good pizza is always a win in my book. 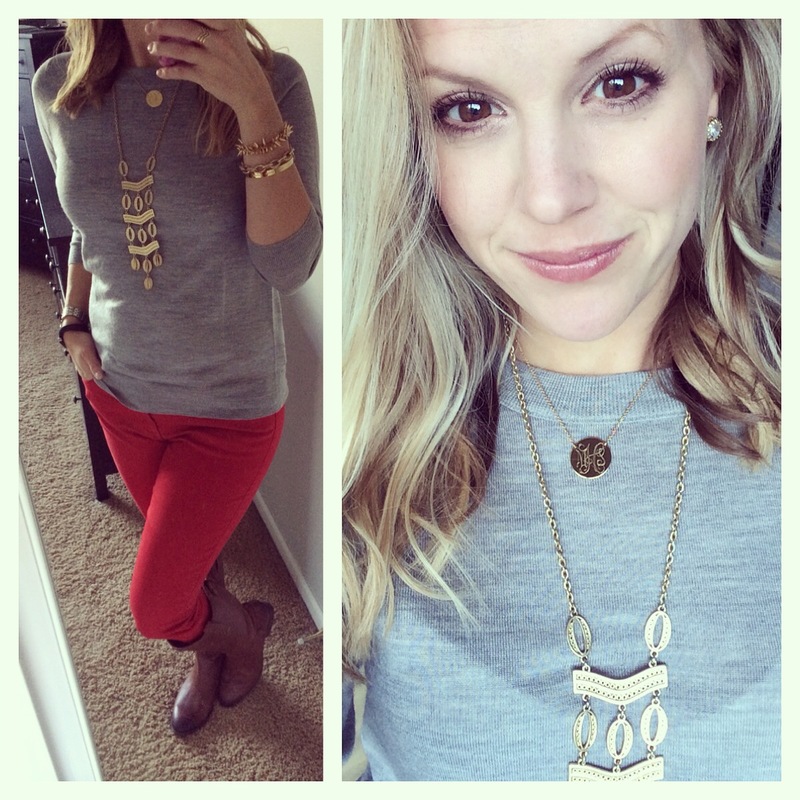 And I don’t know about you, but I’m ready to be stuffed like a Thanksgiving turkey this week! 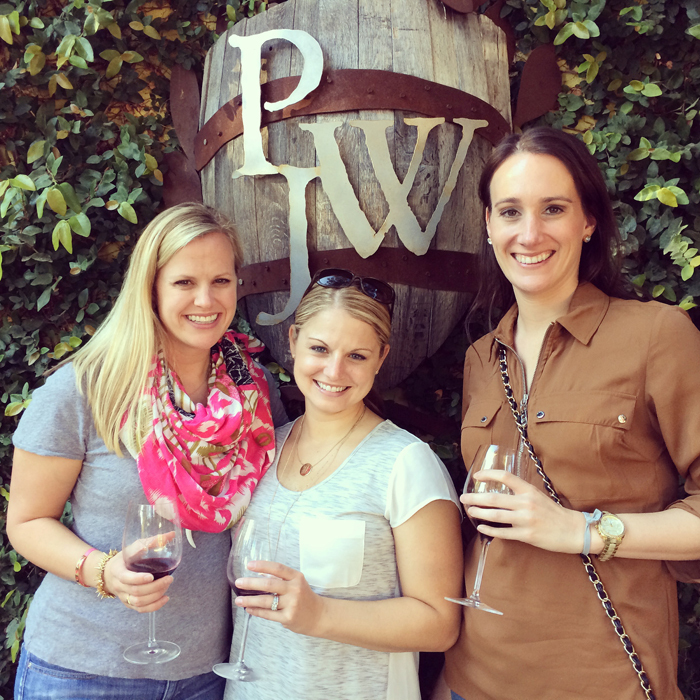 For our final day in Napa, we had plans to visit 4 more wineries that we’d heard great things about. Our driver Denise, who I mentioned in my “Day 1” post, did not disappoint on our farewell tour of wine country. Winery 1:: James Cole Estate Winery turned out to be one of my favorites of the trip. We were the first to arrive that day, so it was quiet and we had the place to ourselves for a special little tour of some of the back rooms where the wine is made and stored. The girl hosting our tasting was very knowledgeable about the history of the winery, which was impressive because she’d only been there since this summer. She and the other staff we met have a really great vibe and made it such a fun, laid back experience. James Cole is a husband and wife owned winery, and they actually live on the property just next to the tasting room area where we spent our morning. 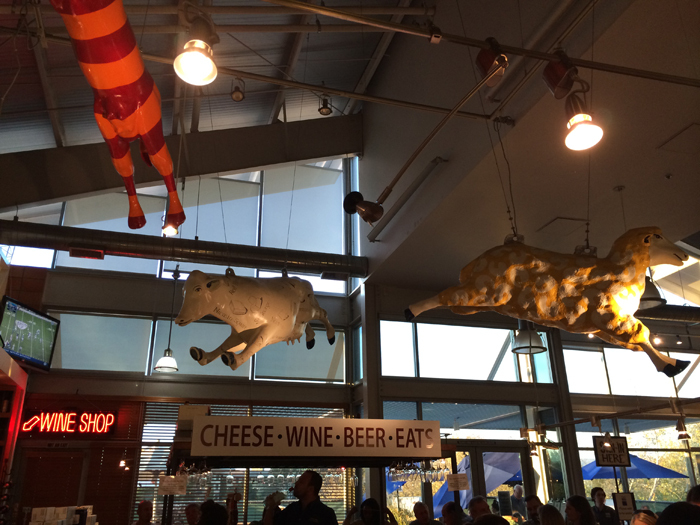 Their logo, which looks like a Texas Longhorn from a distance, is actually modeled after a sculpture the owners bought (it’s showcased in their tasting room). 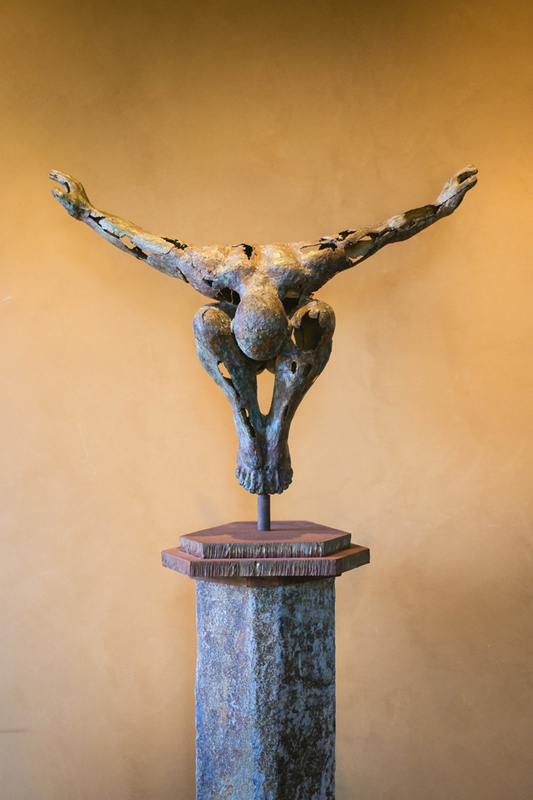 It is is of a man mid-dive, and I believe the title is “Aliento,” which is Spanish for “breath” (you’ll also see a bottle of their wine by the same name below). 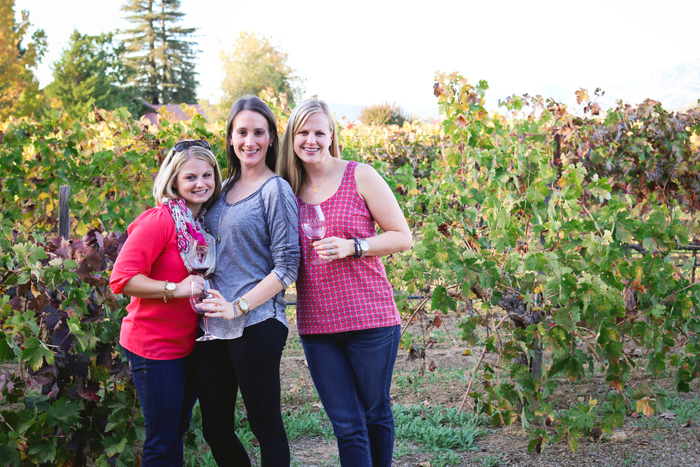 We were told that it represented their lives at the time when they took the plunge to move to Napa and begin their winery journey — taking a dive headfirst into a dream. Pretty neat story. 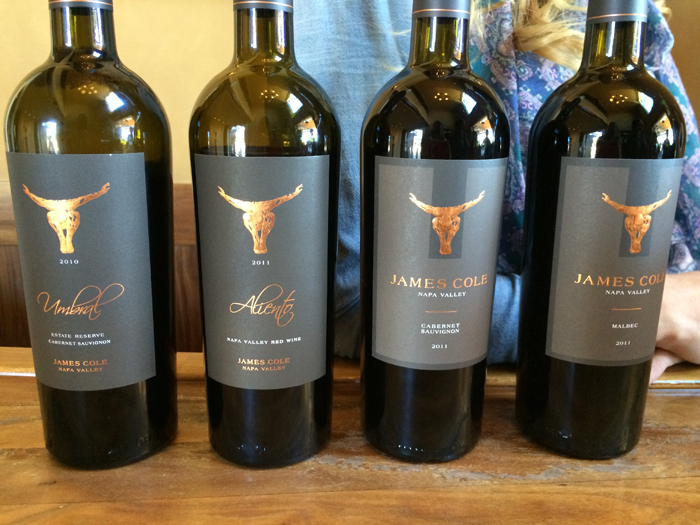 All of the wines we tasted at James Cole were exceptional, but one really stood out — the Pinot Noir Icewine from Canada. 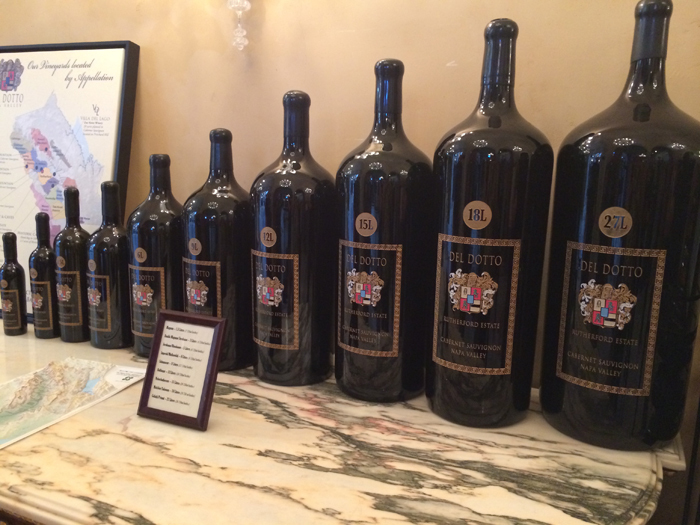 Per the Napa Wine Project, this is a rare wine that is made in extremely small quantities. In order for it to be considered “icewine,” the grapes must be frozen for at least 3 nights in a row. The Brix (sugar level) is usually in the upper 30’s-low 40’s — which is very sweet. 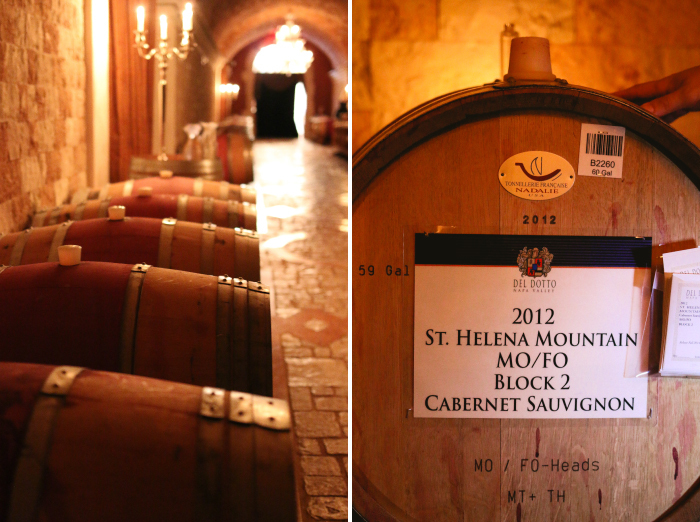 The wine is then aged in Acacia wood barrels which help to impart a honey spiciness into the wine. 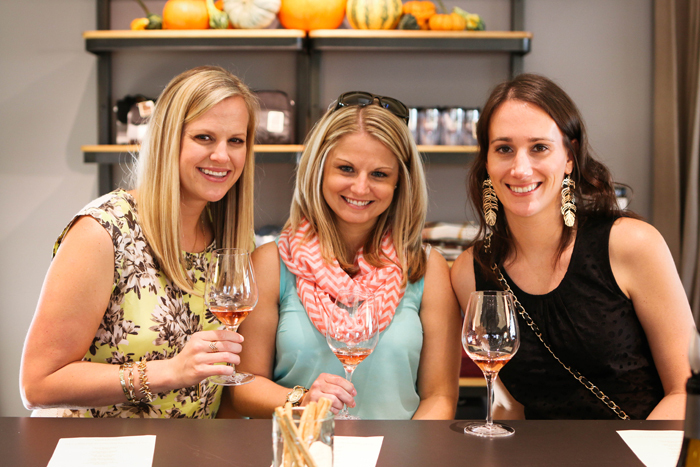 I’m not typically a fan of sweet wines, but all three of us let out a collective “oooh!” as soon as we tasted it. A rather small bottle sells for a pretty penny due to the small production, but I’m excited to share it with my family as a special treat this Christmas. Winery 2:: Regusci Winery felt like we stepped away from the States and right into Tuscany. I loved the old world feel of the property, and while we didn’t have time that day, it would be fun to go back for a tour. 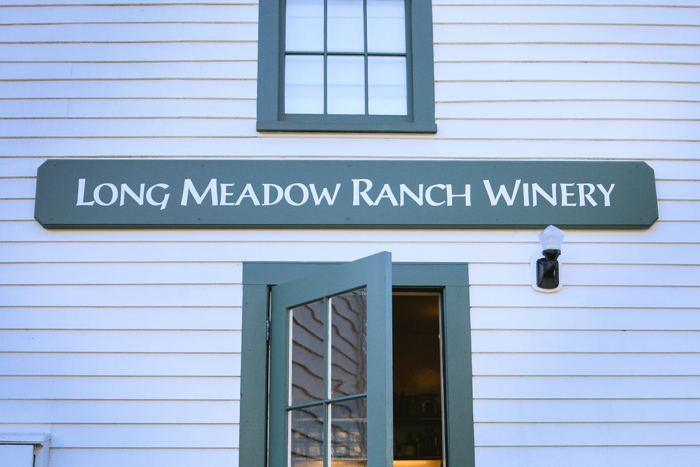 We enjoyed 4 of their current wine selections, and even though I’m not much of a white wine drinker these days, their 2012 Chardonnay was incredibly smooth. They also offered freshly made Arancini Balls, which I could have eaten a dozen of. Lunch:: We stopped at Oakville Grocery for a picnic lunch, and it made for yet another memorable meal in Napa. Denise called ahead to order a charcuterie and cheese platter for us, and that was the way to do it. 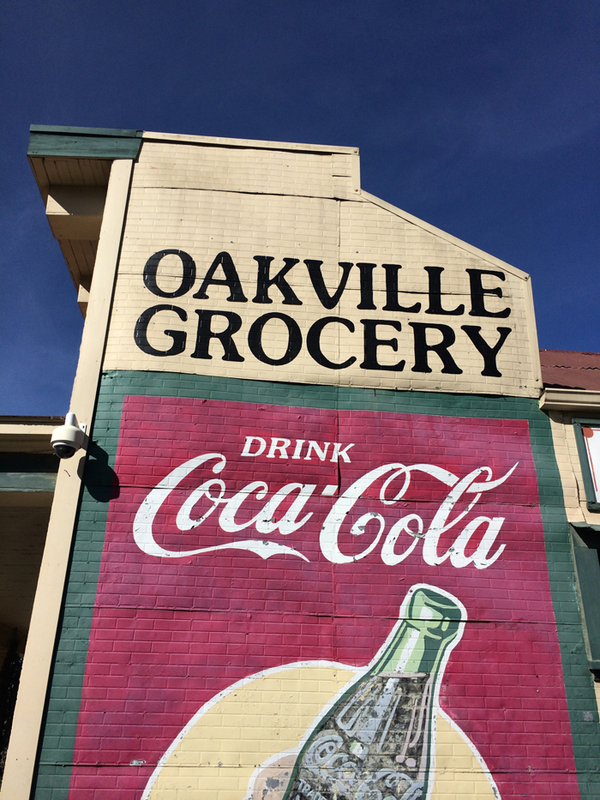 Oakville originally opened in 1881, and it was quite a pretty site inside — I could have stayed in there all afternoon looking at the various locally made olive oils, cheeses, spices, jams, and spreads. 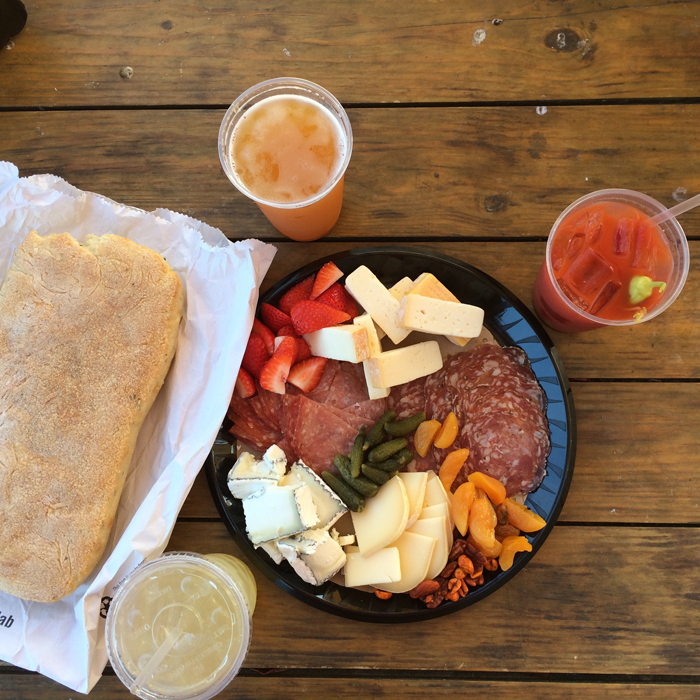 Meats, cheeses, the biggest loaf of focaccia bread ever, tasty beverages from an outdoor drink stand, and gorgeous weather. Winery 3:: Silver Oak Cellars was not on our original itinerary, but we fit in a quick stop for our friend to buy a gift… and of course we needed to taste the wine while we were there. 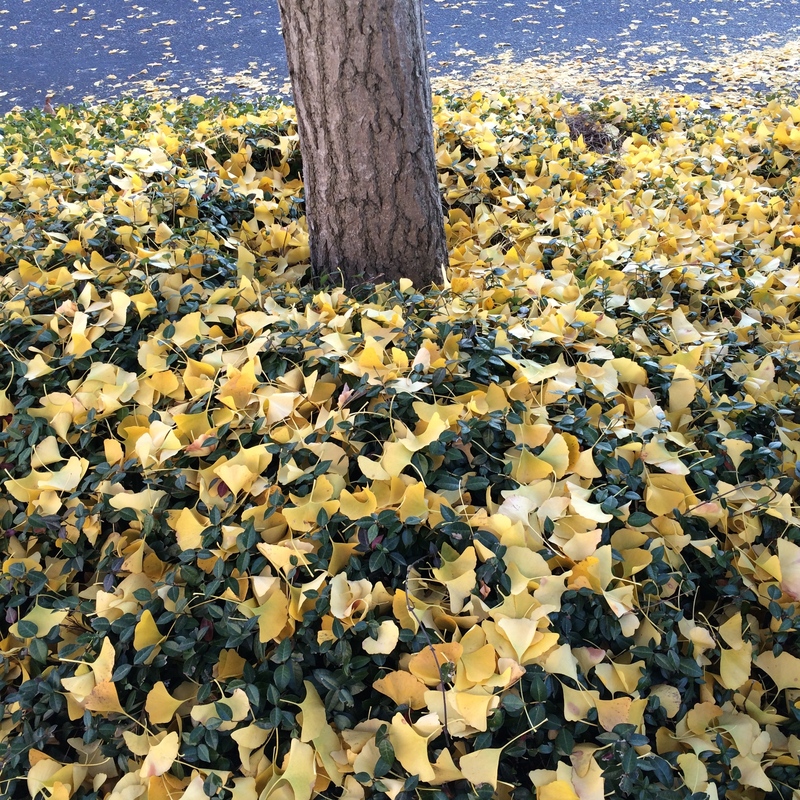 Yet again, this property was immaculate and picturesque. It was far too busy and commercial-seeming for my taste, but then again, it was a Saturday, and we didn’t reserve a private tour. 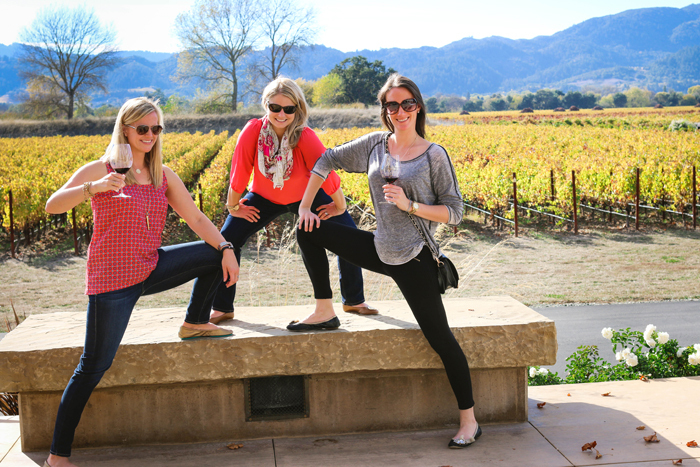 So I’d imagine there are probably better ways to visit Silver Oak for a more personal experience. 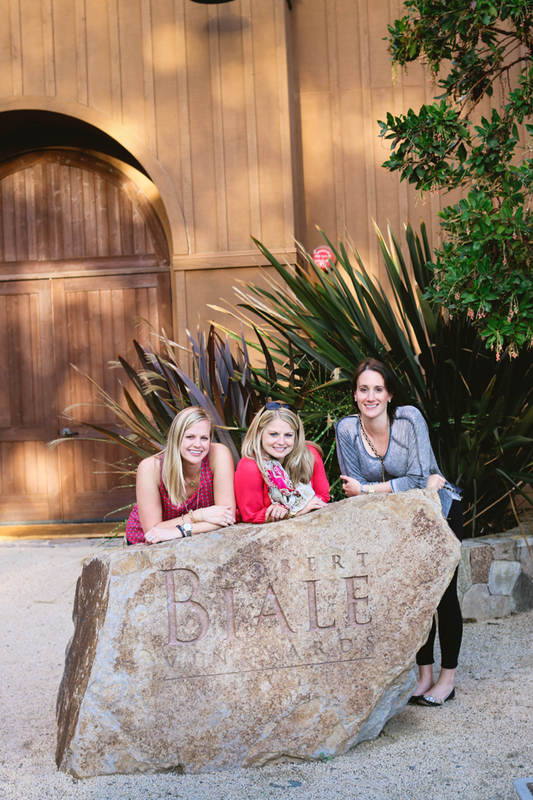 Winery 4:: Robert Biale Vineyards — home of the Black Chicken! 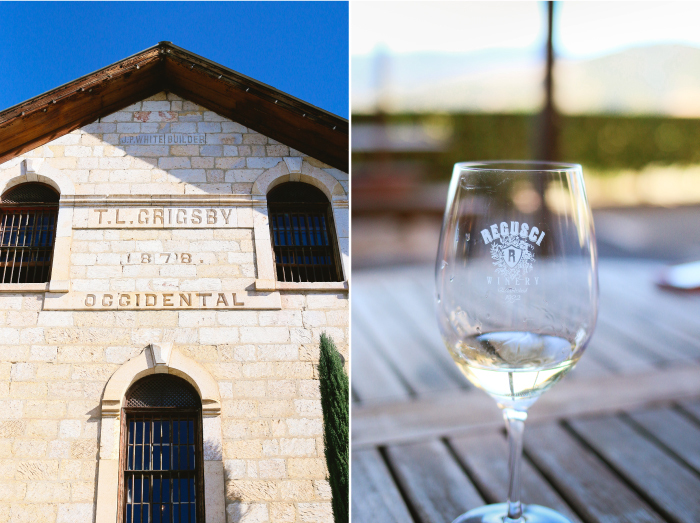 Denise recommended this winery due to a couple of us loving Zins, and it couldn’t have been a better experience as the last stop on our tour de wine. So what is Black Chicken? Along with growing and selling their grapes, the Biale family also sold produce and eggs from the white chickens they had on their property. During Prohibition, Aldo Biale began selling homemade wine, but because his home phone was a “party line,” customers would order his secret wine with the code name “Black Chicken.” And thus, a legend was born. 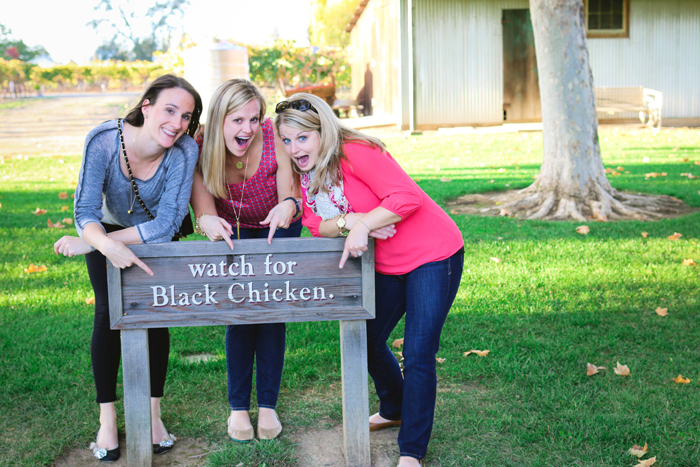 We of course tried their 2012 Black Chicken Zin, which did not disappoint. 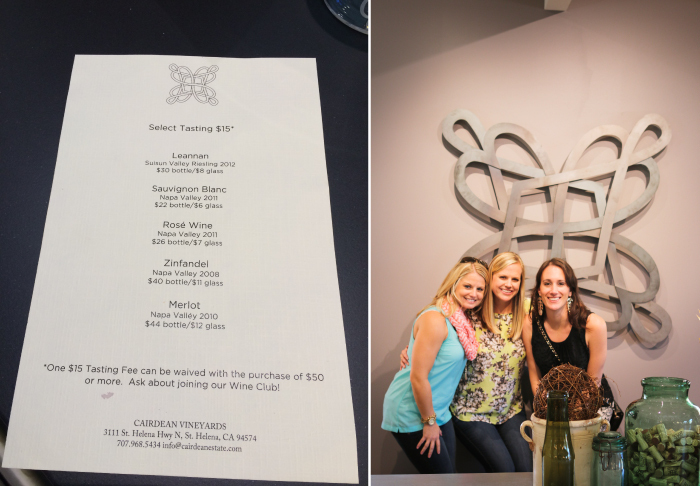 Our wine tasting host was simply lovely — he was an older gentleman who is a retired police officer turned wine lover, and he spent the entire hour-long tasting with us. We loved the personalized attention, and because we were sitting on their outdoor patio right next to the vineyard, he let us pull and eat grapes right off the vines. Let me tell you — those little seeded grapes are SO much better than the seedless ones from the grocery store! 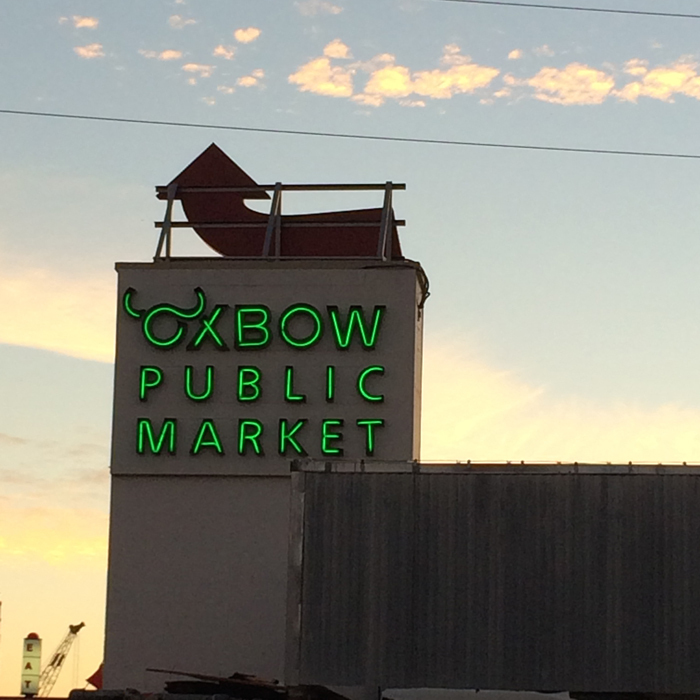 To cap off the trip, we took a drive to downtown Napa to wander the Oxbow Public Market. I wish we’d had time to eat dinner there, because I wanted one of everything. I did try a miniature Kara’s Cupcake, which was to die for, and we bought some lovely local infused olive oils and balsamic vinegars from The Olive Press to take home. I can’t say enough how wonderful, relaxing, fun, and much-needed this girls trip was. 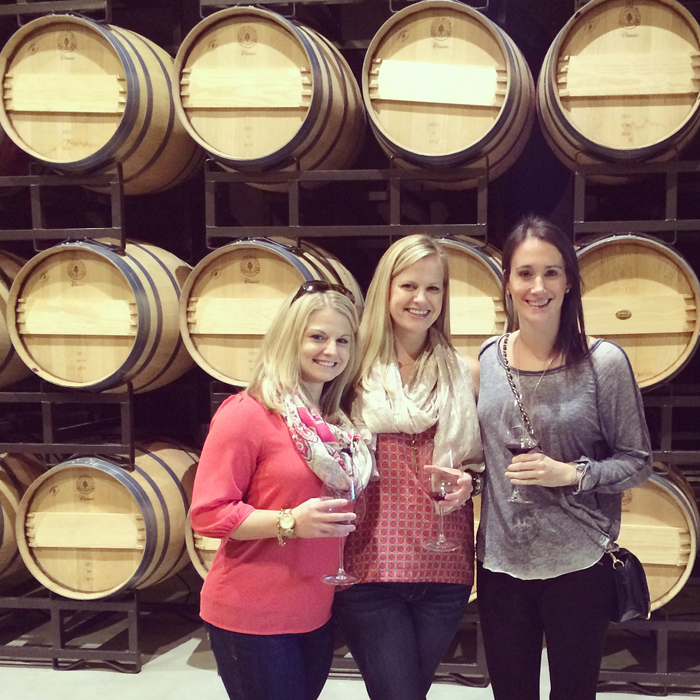 We even learned a lot about wine making, which I’ve realized is incredibly interesting. Wine country has such a laid back, appealing lifestyle that makes for a truly incredible vacation from the hustle and bustle of real life. I can’t wait to bring Craig back, and once I do, I have a feeling this is going to become a go-to vacation spot whenever we have the luxury. 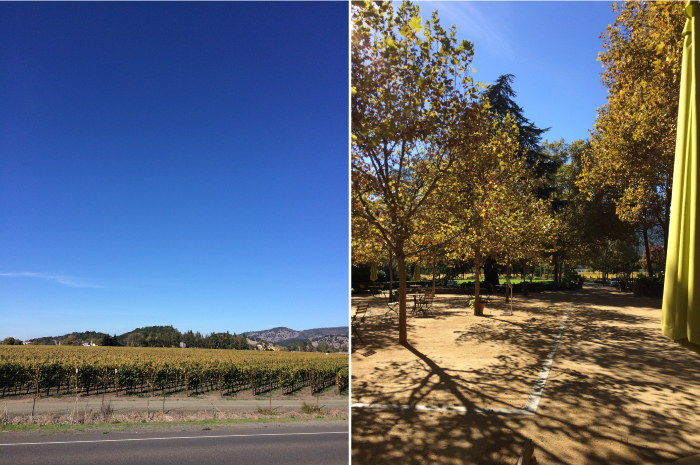 To break up the trip a bit, we booked a day of bike rentals through Napa Valley Bike Tours, located in Yountville, the cutest town ever (btw, it’s pronounced “yahnt-ville”). We opted for the non-guided tour and chose what was deemed the “intermediate route” — Rutherford Loop, which was approx 17 miles in total. 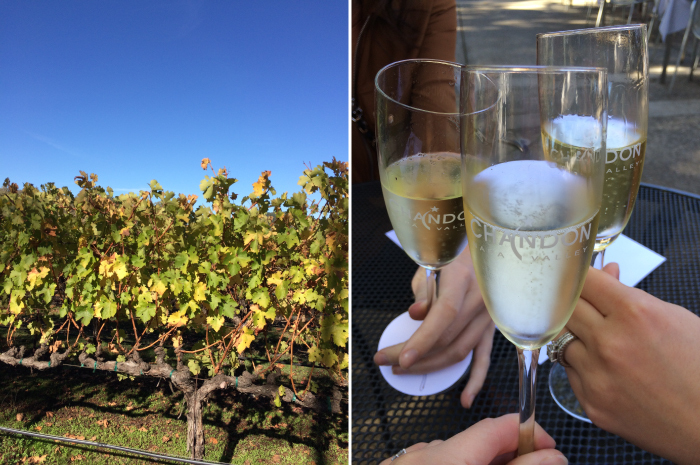 Winery 1:: Domaine Chandon — poppin’ bottles of champagne! We biked just down the street to this gorgeous property, and what better way to begin our day than with mimosas…without the OJ? 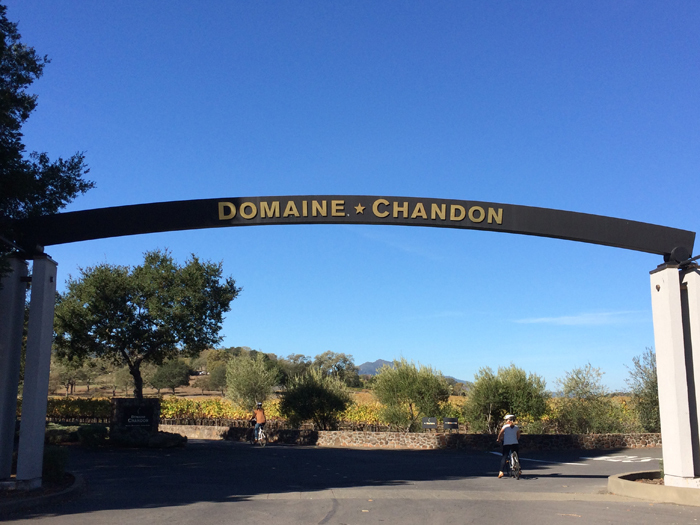 Domaine Chandon is serene and beautiful — I felt like I was walking into a nature conservancy or botanical garden. We chose a sparkling wine tasting that included 3 glasses each, and we sat out on the tree-covered patio to “cheers” our fun day ahead. Winery 2:: St. Supéry Estate Vineryards & Winery was an pretty impromptu visit after missing our reservation at Cakebread Cellars due to a wrong turn and a few extra miles of biking. (oops!) As you can see below, the entrance is picture-perfect. The tasting room was pretty modern and quiet, and we once again enjoyed our tasting of 4 different wines out on the patio. 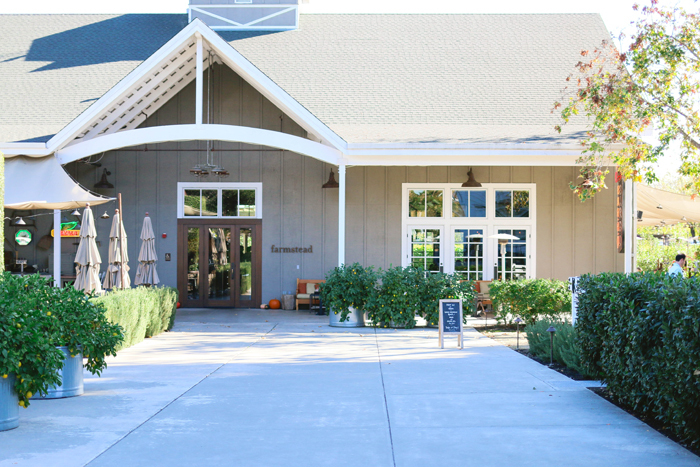 According to their website, they are the largest family owned, sustainably farmed and estate produced winery in Napa Valley. I wish they would have offered more information and history on the winery itself during out visit, but perhaps that’s included with other offerings. Lunch:: La Luna Market & Taqueria is legitimate, delicious, CHEAP Mexican food. It’s located in the Rutherford area, and it was a great stop along our bike trail. Each of our lunches cost about $11-12, and we had enough food to feed a tiny, bike-riding army. 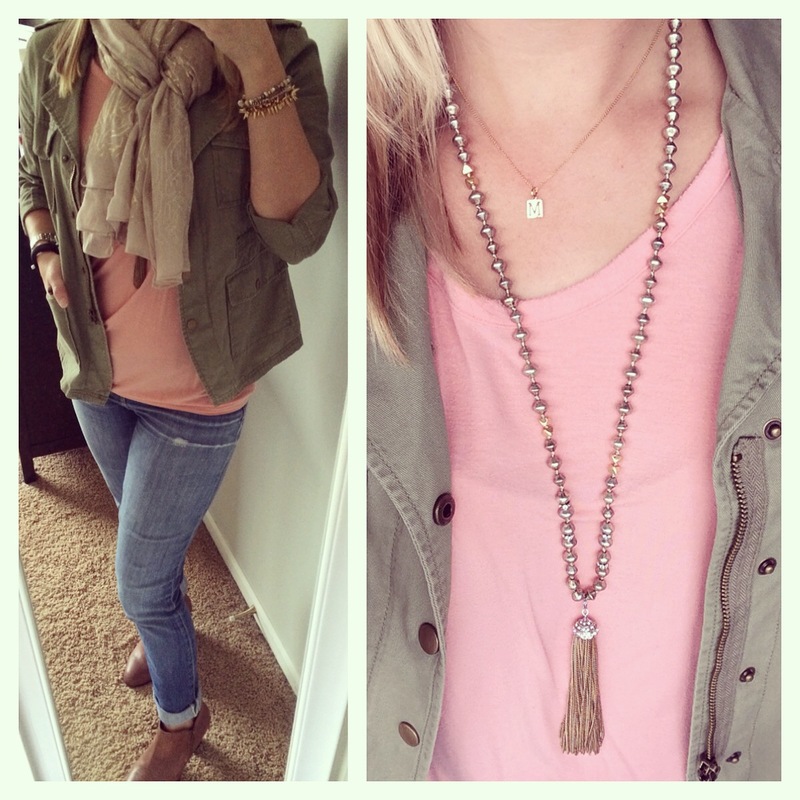 I love how casual and “local” it felt. Just ordering at the counter in the middle of a convenience store… and the food was some of my favorite we had while in Napa. Giant carnitas quesadillas with heaping portions of guacamole and sour cream — our favorite Mexican restaurants could learn a thing or two from them about not charging an arm and a leg for condiments. Our picnic lunch made for a great break from biking. I just wish I could bike back over there now! Winery 3:: Plumpjack Winery was our last stop along our biking adventure, and it was much-needed. Those “little” hills are no joke! This little place is neat in that it is tucked away in the middle of their vineyard, and the atmosphere is casual and inviting. 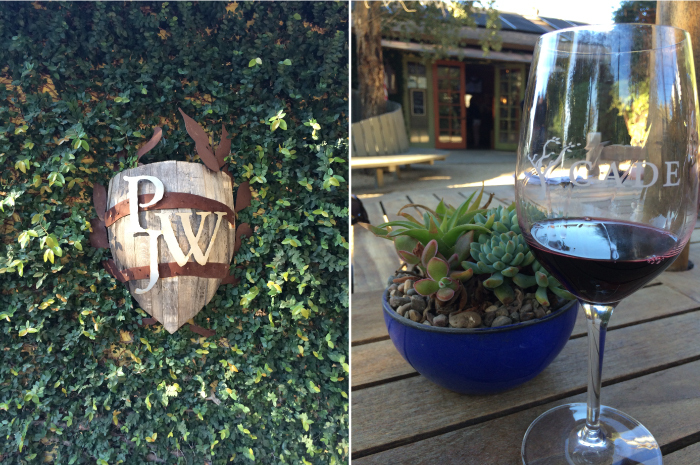 I decided that I really enjoyed the smaller, family-owned wineries better than the crowded, more corporate-feel of some of the larger ones. 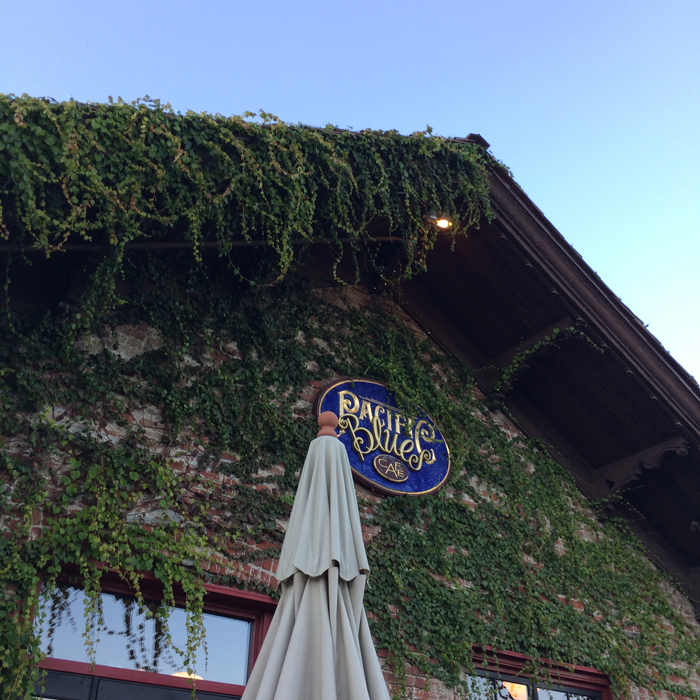 We ended our day with happy hour at Pacific Blues Cafe in Yountville and a most delicious dinner at Celadon in downtown Napa (which was much larger than I’d envisioned). Our meal at Celadon was outstanding — from the Macadamia nut crusted goat cheese with port-poached figs to the Endive and pear salad with blue cheese to our entrees. We were too stuffed for dessert, but I’m sure we wouldn’t have hated it. 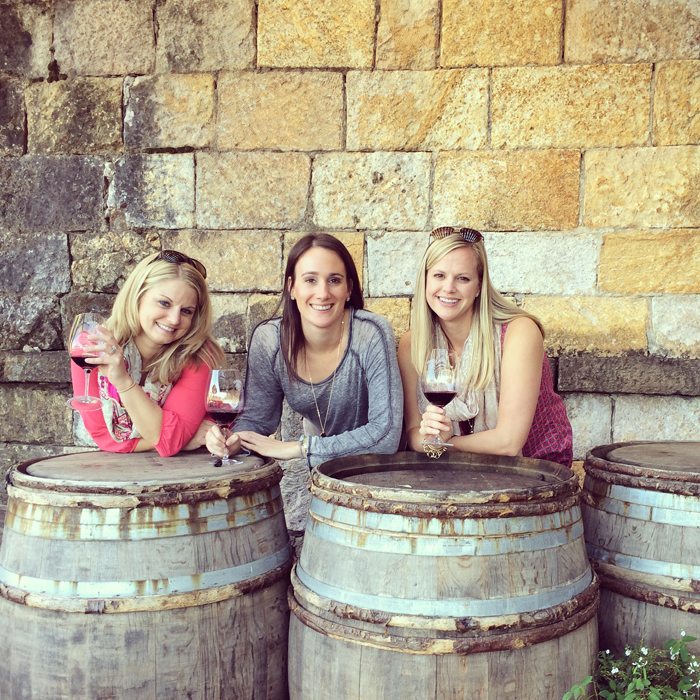 Biking through Napa for wine tastings was both a great and a bad idea. 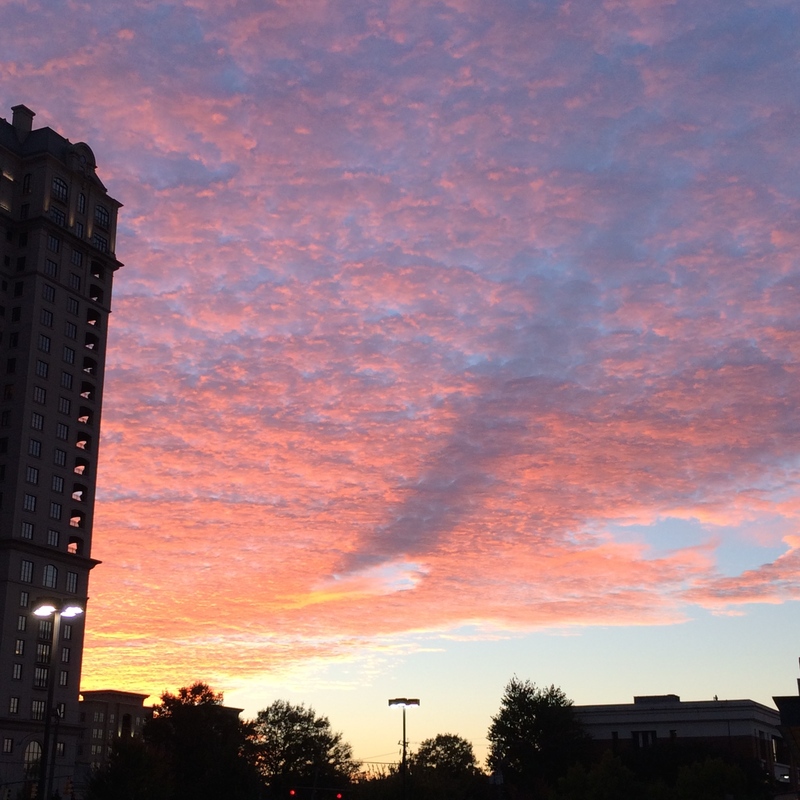 The weather could not have been more beautiful, especially for November. It was 75ish degrees and sunny outside, and there was a lovely breeze in our hair as we pedaled past rolling hills of yellow grape leaves — and the sunset over the vineyards was something out of a movie. 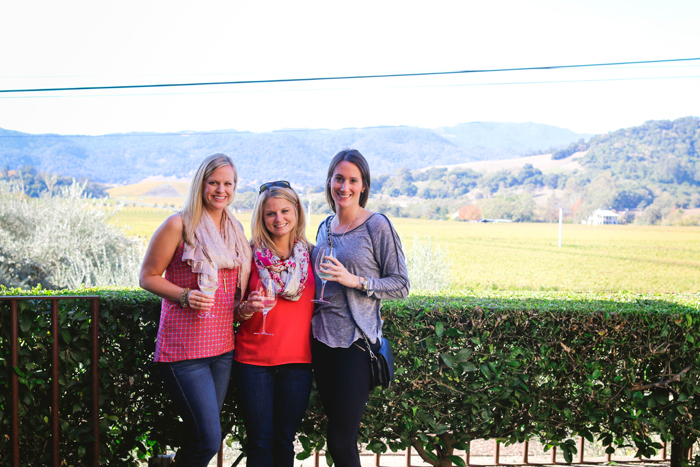 BUT — partaking in wine tastings and then having to huff and puff it up and down hills on a bike to the next winery is not the best idea we’ve ever had. It was a great way to see parts of Napa that I don’t think we’d have paid attention to while in a car, though, and I’m so glad we did it. 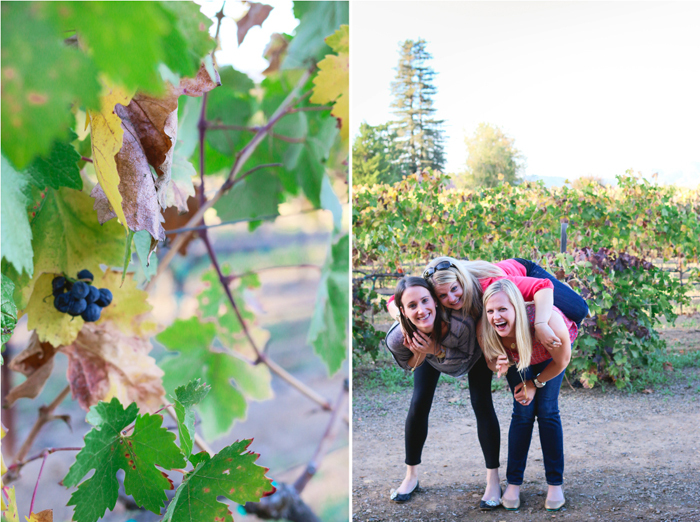 Oh Napa, how I love you. 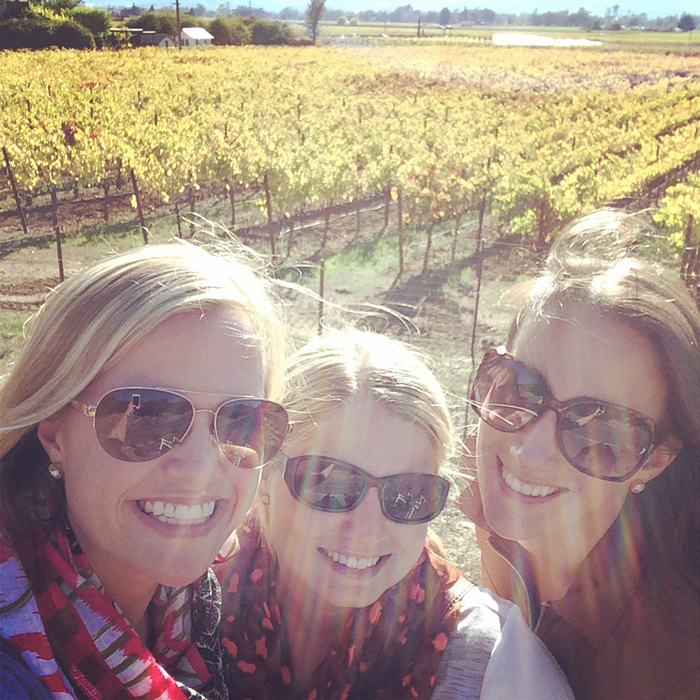 I just returned from a somewhat impromptu (for me, the eternal planner) trip to Napa Valley with two of my best girlfriends. It was a much-needed break after the insane month of October where I juggled my full-time job along with the busiest month of the year for my photography business, as well as some other fun things mixed in. I think the consensus was that all three of us did not want to leave. 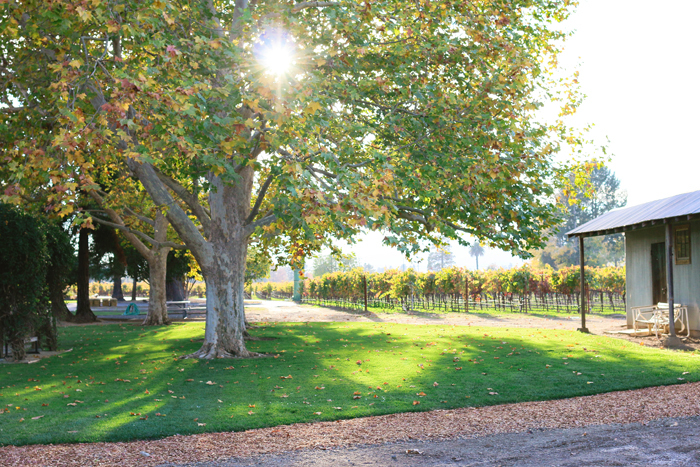 We’re already dreaming of when we can return to wine country. 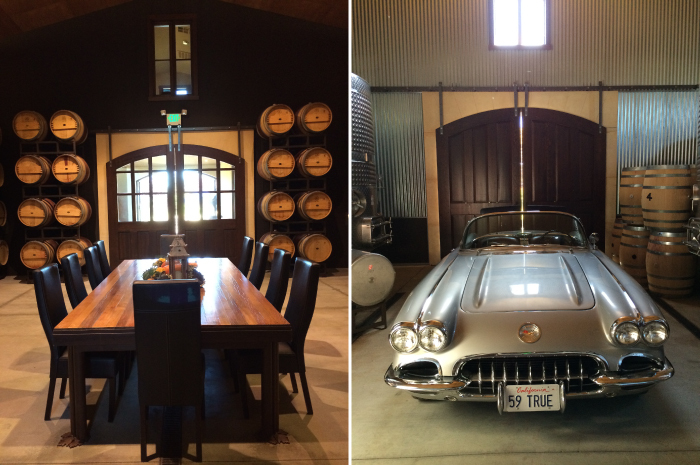 Upon the recommendation of a friend and her fiance who frequent the Napa/Sonoma area, we hired a driver for 2 days. Her name is Denise, and I’d gladly recommend her to anyone traveling there — she was amazing!! 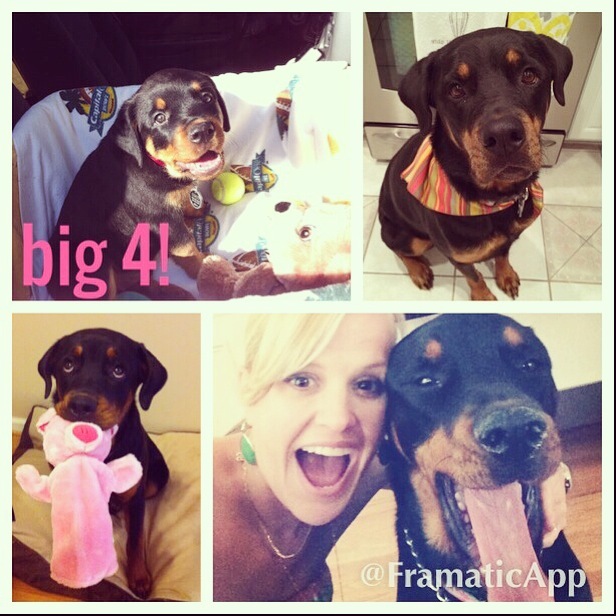 She really was so much more than a driver — she was more of a concierge. Denise was completely invested in our trip and truly wanted to help us make the most of each day. Without her, we would have missed out on some great little wineries, places to eat, photo ops, and just a general good time. Winery 1:: Our first stop of the trip was Raymond Vineyards, which was one our friend Ashley’s (also known as Cheese) favorites on her first visit to Napa. The property is so pretty and even more interesting. 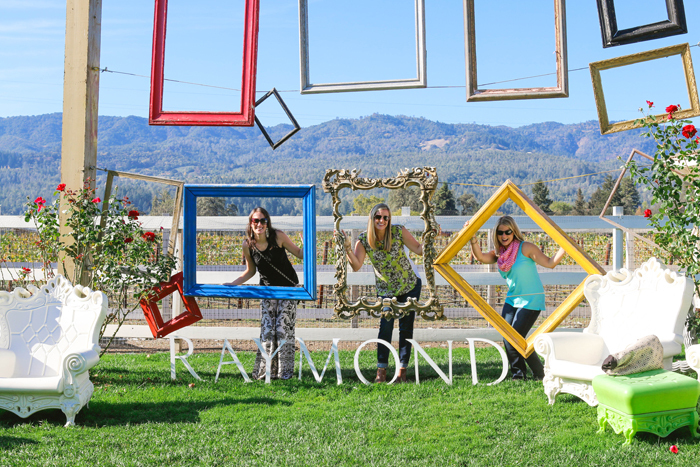 Giant hanging frames make the best photo op outside, bronze sculptural hands hold wine bottles over the tasting bar, and there are several rooms to visit inside. 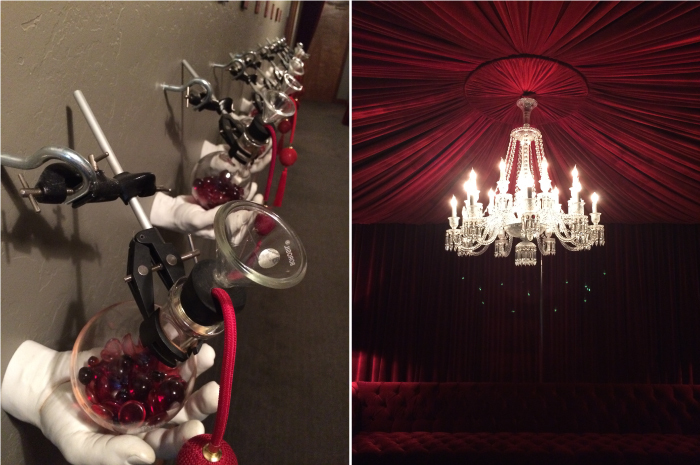 The Corridor of Senses allows you to smell a variety of different scents and flavors that you might find in different wines — our favorites ranged from berries to pepper. Least favorite was definitely the truffle! 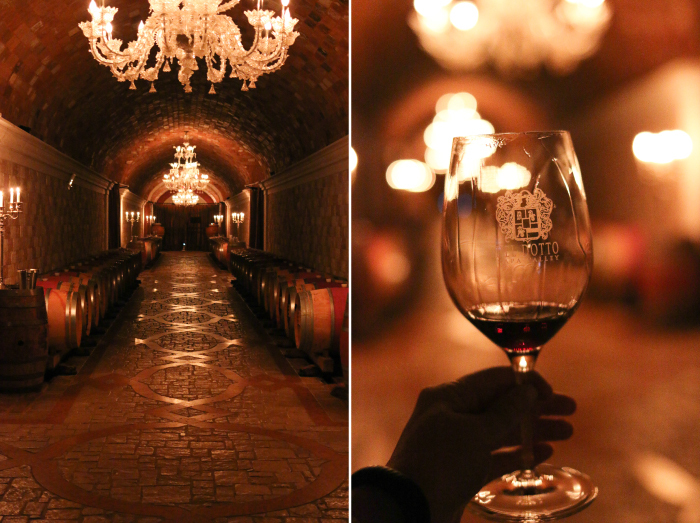 Some other experiences include the Red Room, Crystal Cellar, and Rutherford Terroir Room (filled with 16 different soil samples from around Napa, which each contribute to differences in the grapes grown in those areas). 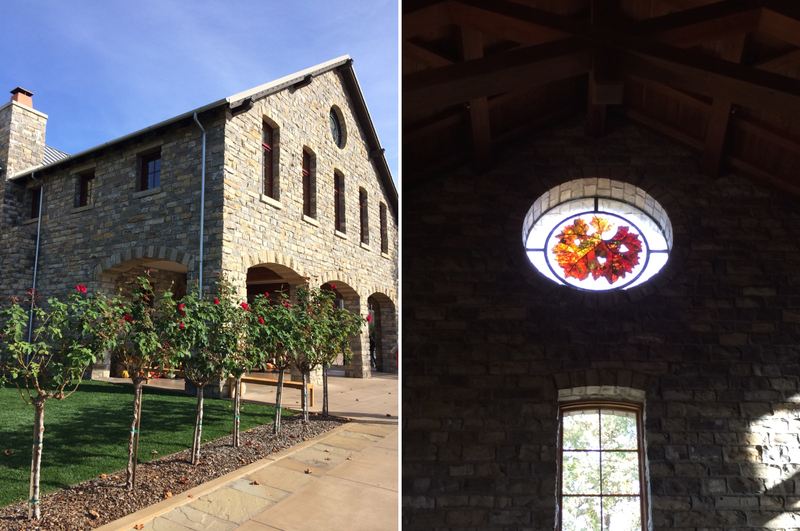 Such a neat place to introduce us to the Napa wine scene! Winery 2:: On our way to the next stop, Denise suggested we stop by Cairdean Estate, a relatively new vineyard and winery. Our host Deano was so much fun, and we loved that he talked to us about the wines in a very unpretentious way. Plus, we had the place all to ourselves, which was a treat! Cairdean is Scottish Gaelic for “friends,” which reflects their belief that wine is meant to be shared by those held close to your heart…. that couldn’t have been more fitting for our little traveling trio. 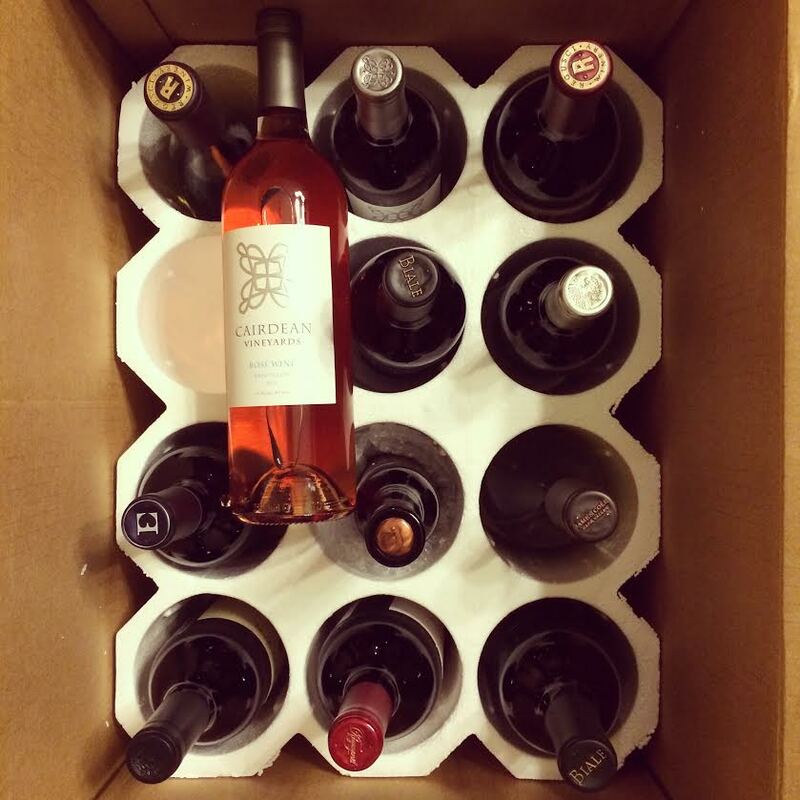 Of the 5 wines we tasted, I loved their Rose and Zin the most. 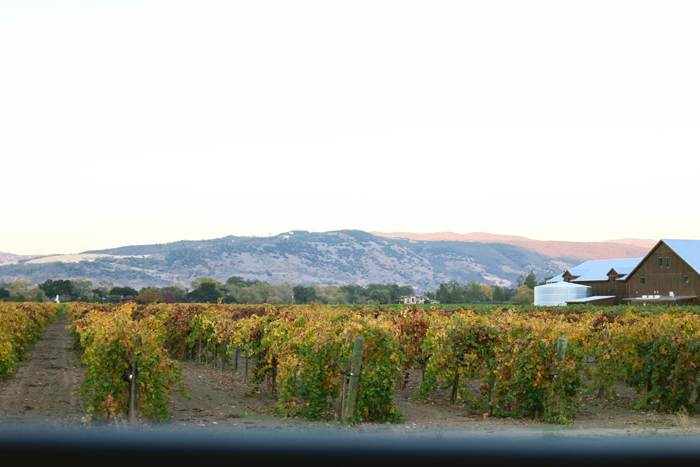 Read more about this family-owned winery here! Winery 3:: Ehlers Estate was on my friend Danielle’s list after having previously tasted one of their wines at a restaurant.This historic property dates back to 1886, and it has so much rustic charm. 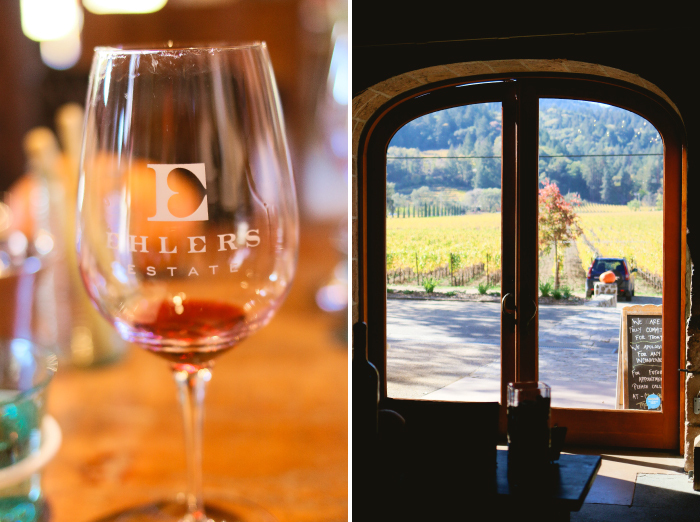 One of my favorite things we learned about Ehlers is the meaning behind both the heart in the “E” logo and the name of one of their wines, One Twenty Over Eighty. As you might guess, the meaning is related to the heart. 100% of the proceeds from the sale of their wines go directly to the Leducq Foundation, which was created to support international cardiovascular research. 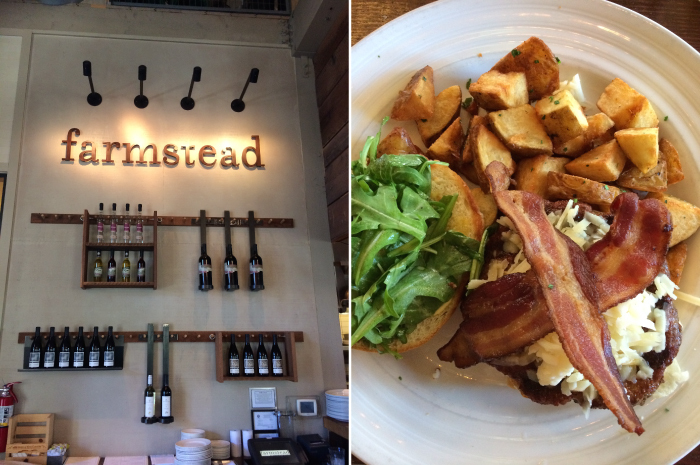 Lunch:: Farmstead at Long Meadow Ranch, which turned out to be the dining highlight of our trip. 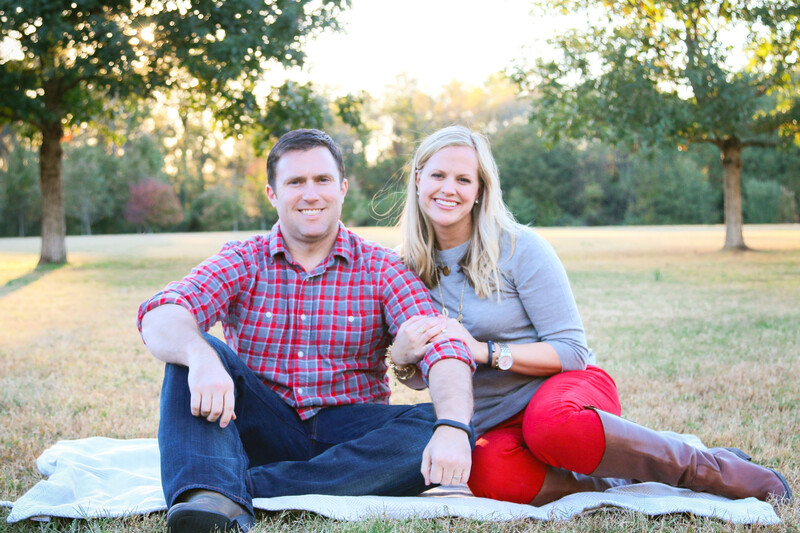 The restaurant itself was rustic and gorgeous, and it was set on a beautiful property. 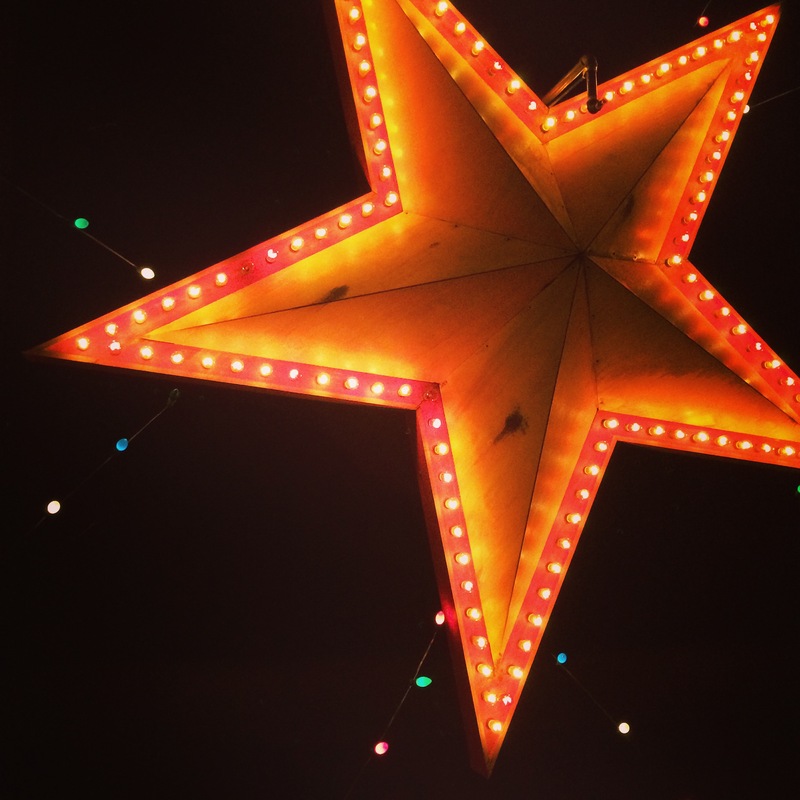 We stuffed ourselves with a hot cheese and olive oil starter, as well as huge bacon cheeseburgers with home fries and the most delicious chicken and mac n cheese dish — and local wine, of course. 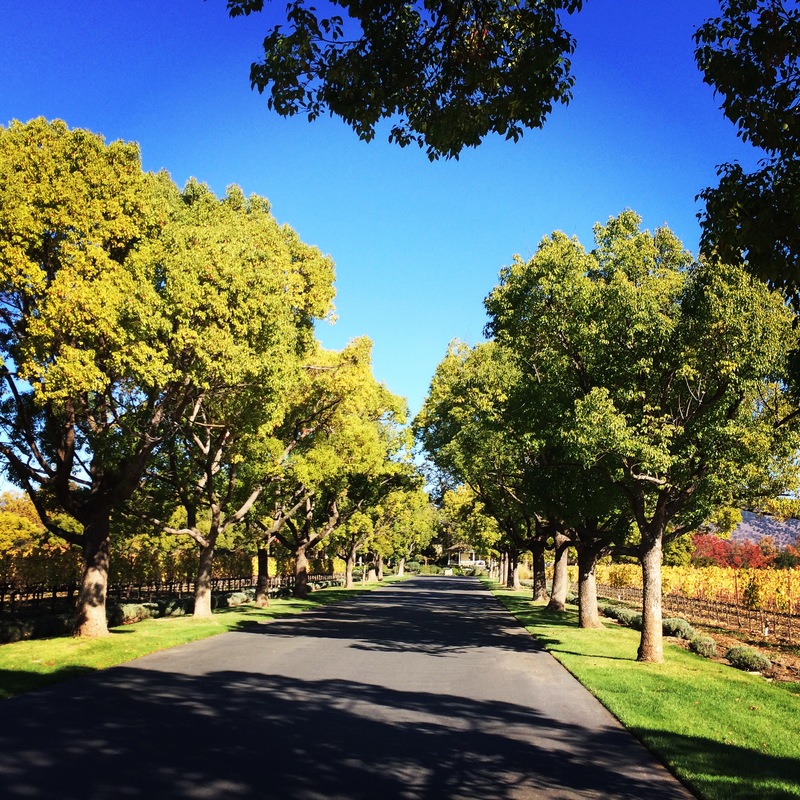 Winery 4:: The last stop of the day was Del Dotto Vineyards in St. Helena. This particular location is modeled after a Venetian Estate, and it was quite grand… maybe a tad ostentatious. We were really excited about the cave tour and the large number of tastings they’re known for; although it turned out to not be much of a “tour,” per se, it was still a fun experience. Aside from being in such a beautiful, candlelit cave, we really enjoyed tasting and comparing wines that were aged in either American or French oak barrels — and the charcuterie and cheese platter at the end was a nice touch! Dinner:: Bistro Don Giovanni in Napa. 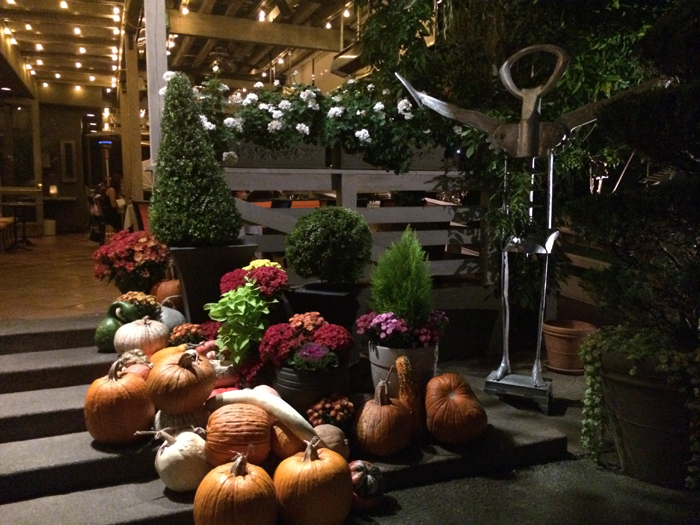 I adored this fall decor surrounding the steps at the entrance to the restaurant. 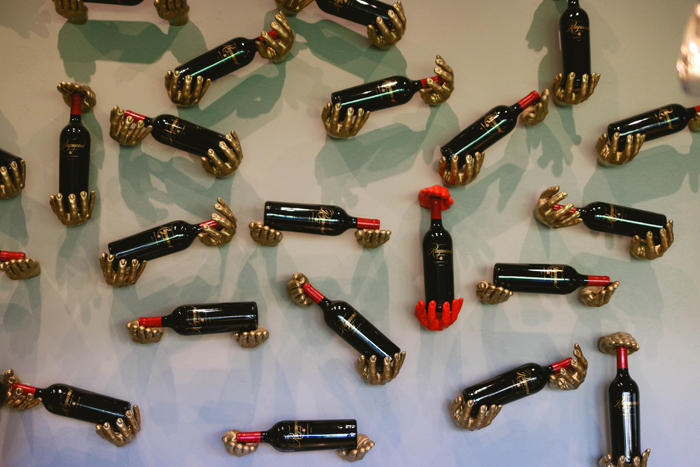 How fun is that wine opener sculpture? The restaurant was quaint, but very lively and homey. A kitty cat even took up residence there and was being fed dinner as we left. We started with the most delicious, homemade ciabatta bread dipped in spicy olive oil and continued the meal with three different pasta dishes. I was far too full from our day of tastings to make a dent in my bolognese pasta, but what I did have hit the spot. 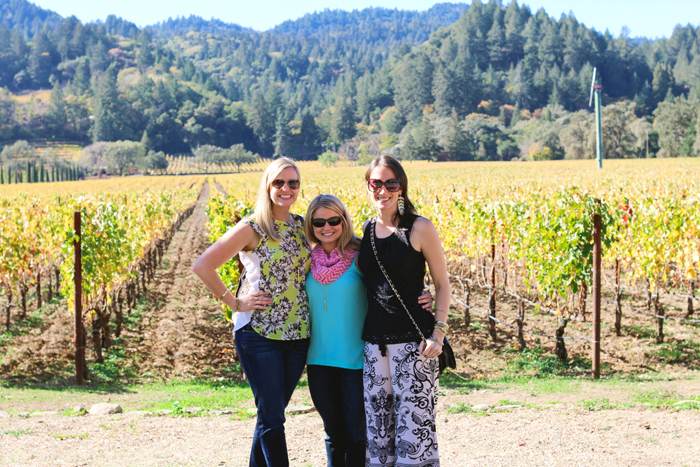 Day 1 in Napa couldn’t have been more perfect! 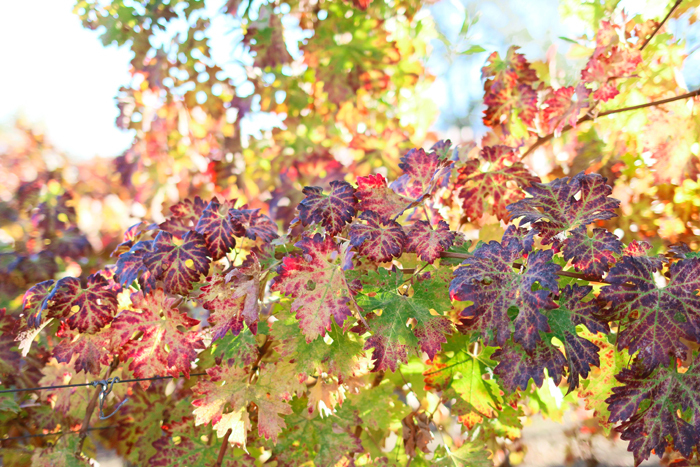 Wine country in the fall is one of the most picturesque places I’ve ever seen. I can’t wait to share our adventures in biking and wining with you next! 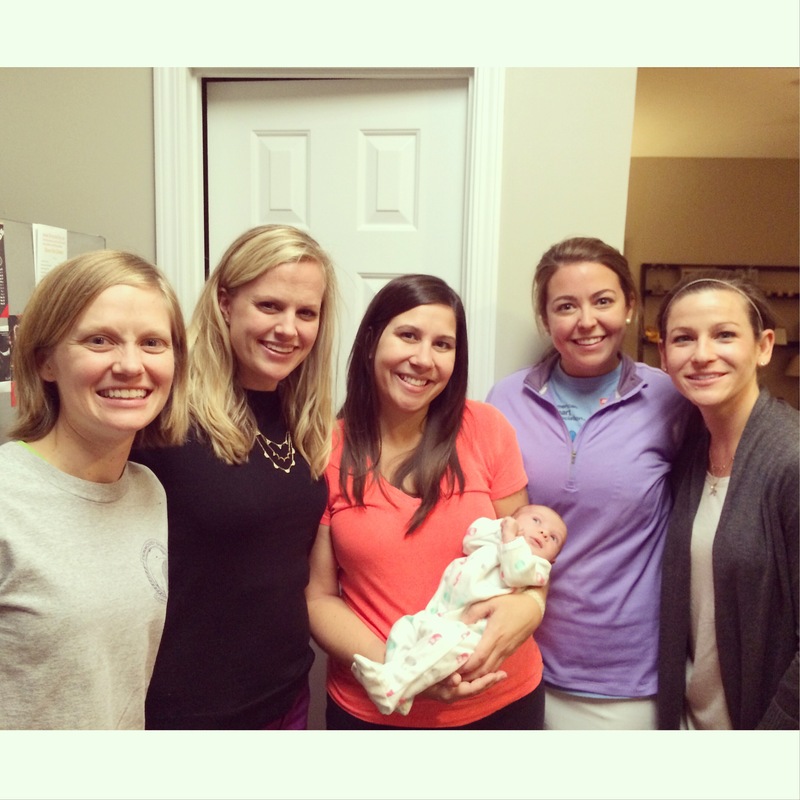 Last week started off just the way I like it, with a girls’ dinner and baby snuggling! Miss Molly has been a most joyous addition to our little Springbluff girls’ group — and chowing down on a couple dozen sweet muffins from Jim n Nick’s didn’t hurt, either. 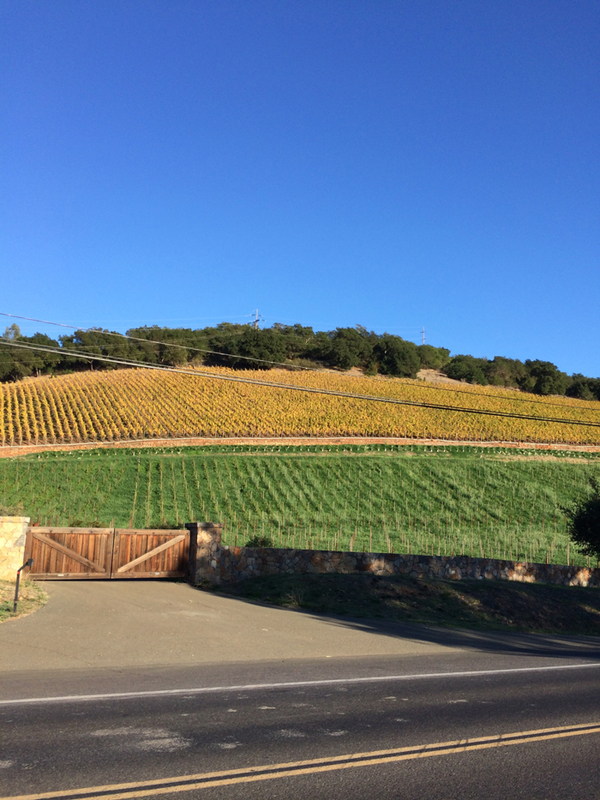 In other news… I’m back from la la land (also known as Napa Valley), and my, what a wonderful and much-needed vacation it was! I can’t wait to share more about it in the coming week. I’m already trying to figure out when I can take Craig back. 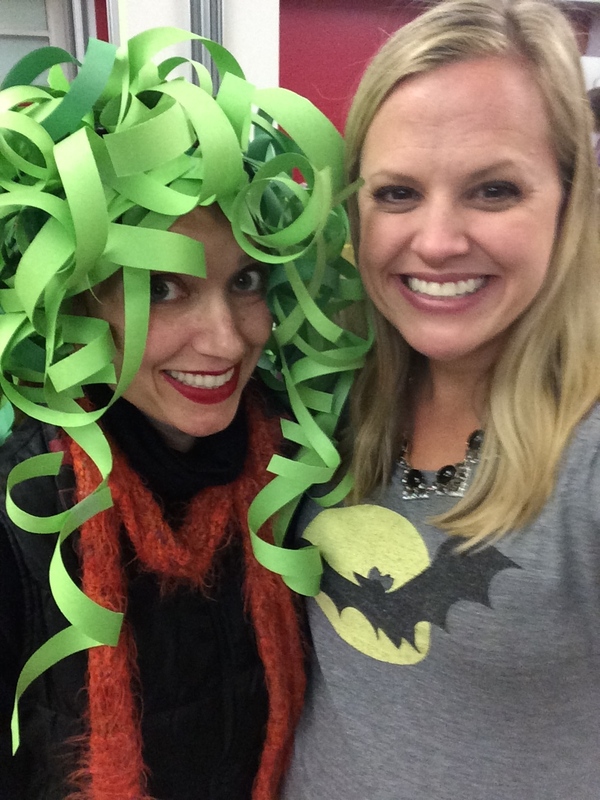 Of course last weekend was great, because Halloween fell on a Friday! 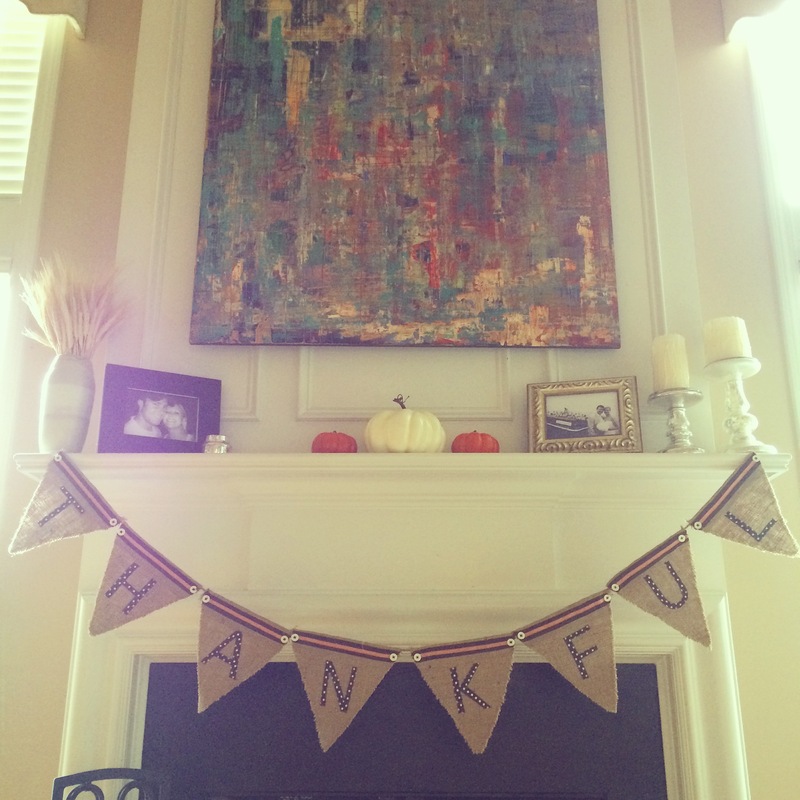 Other than the rain and freezing cold temps that decided to join us, we had a wonderful weekend at home. 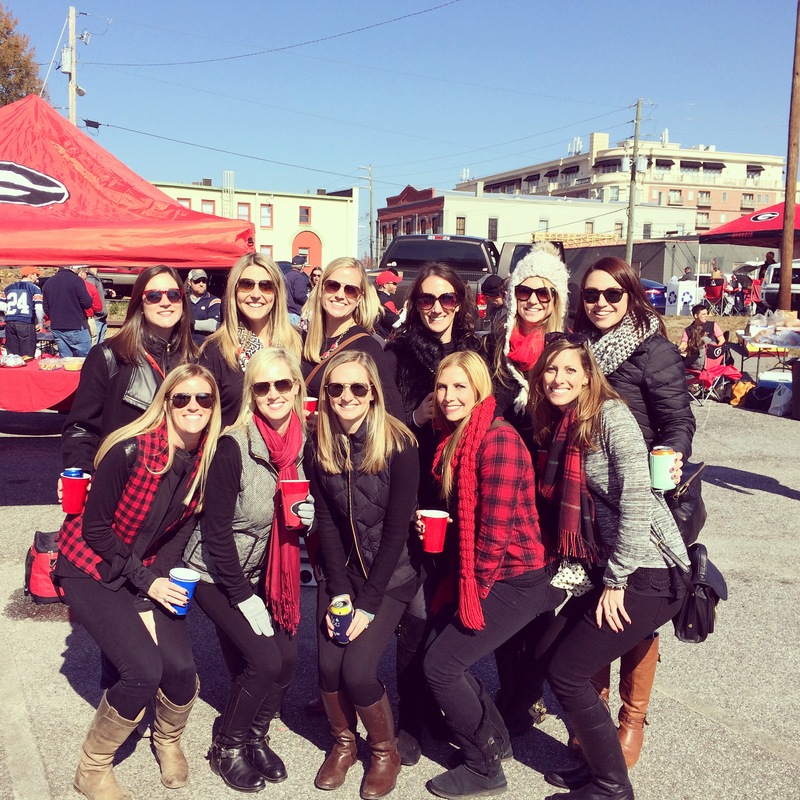 We did almost nothing on Saturday other than venture out to try a new (to us) BBQ place, and then we spent the rest of the day watching college football. 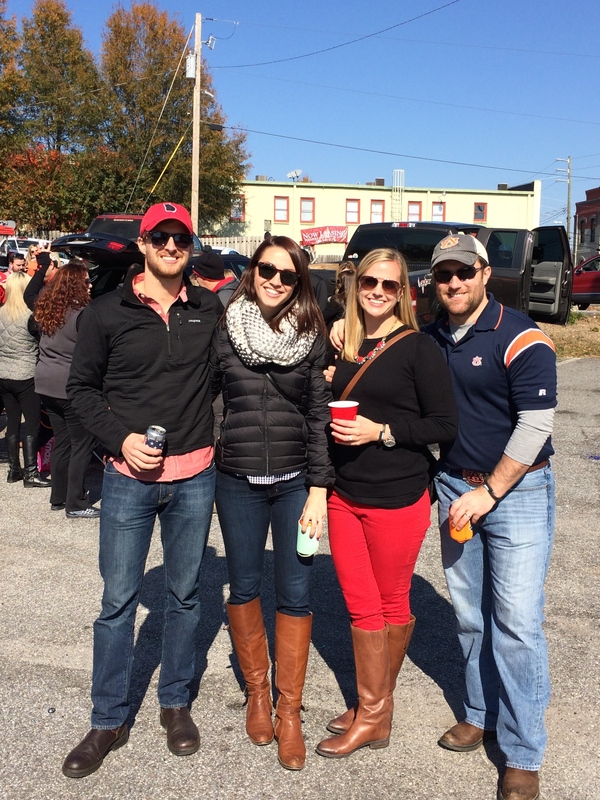 Georgia had a very disappointing loss, but at least Auburn pulled out a win for us. 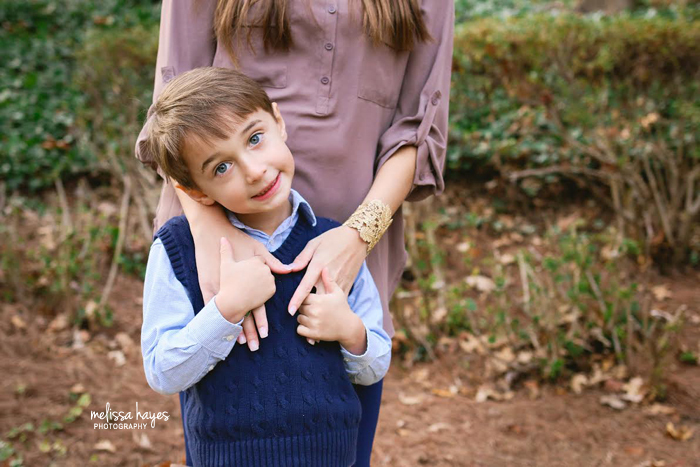 We also managed to take some self portraits for Christmas cards at my favorite nearby park (Whittier Mill in northwest Atlanta). I’m way ahead of the game this year and have already designed and ordered our cards — can’t wait to send them to everyone next month! 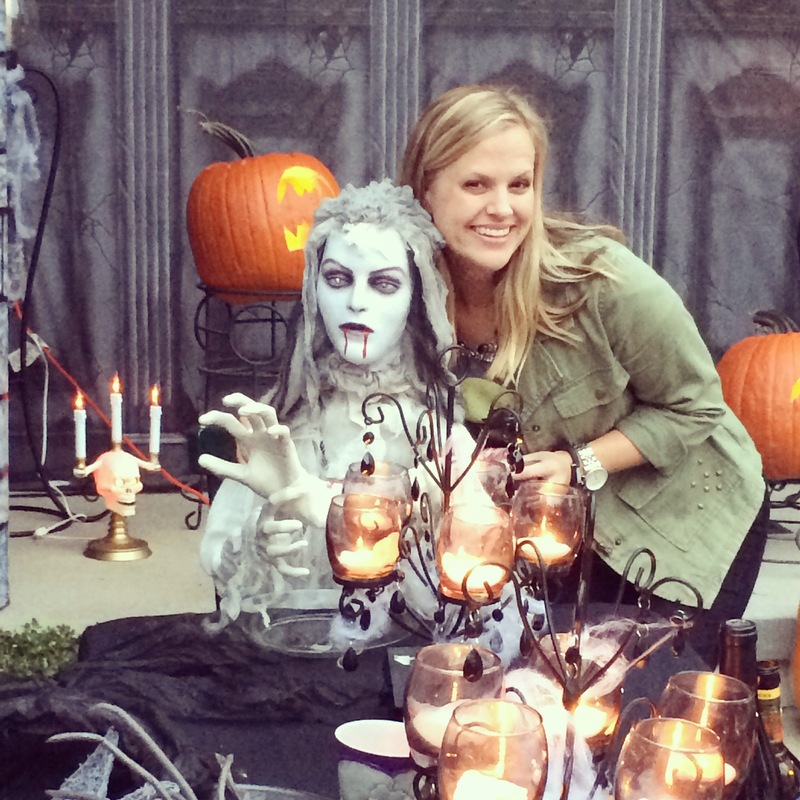 Halloween as an adult is definitely different than it was back in the day (see below for example), but it’s still so much fun to me. We plan a big staff potluck at the Center for Puppetry Arts every year, and I think this was our biggest turnout yet. 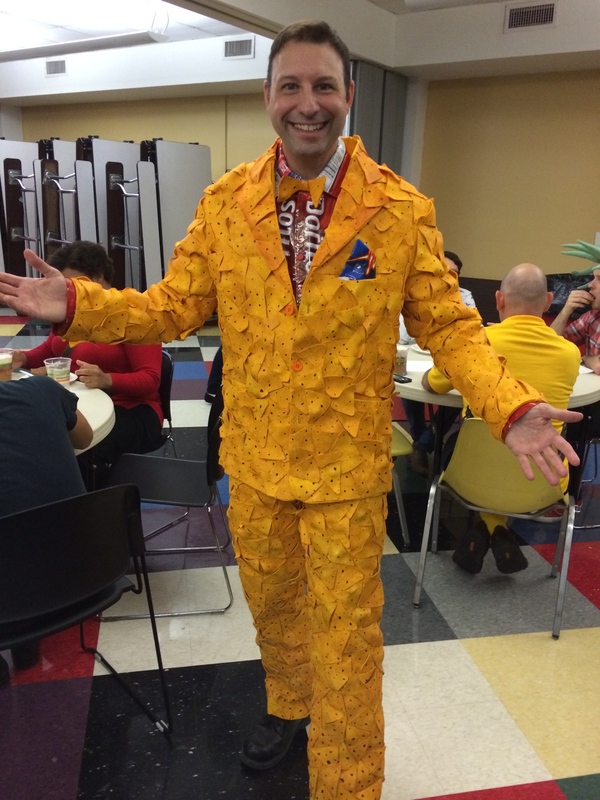 Some colleagues show up in costumes, and my favorite was the homemade DORITO suit! (No Doritos were harmed in the making of this costume — the construction is way more impressive than that.) 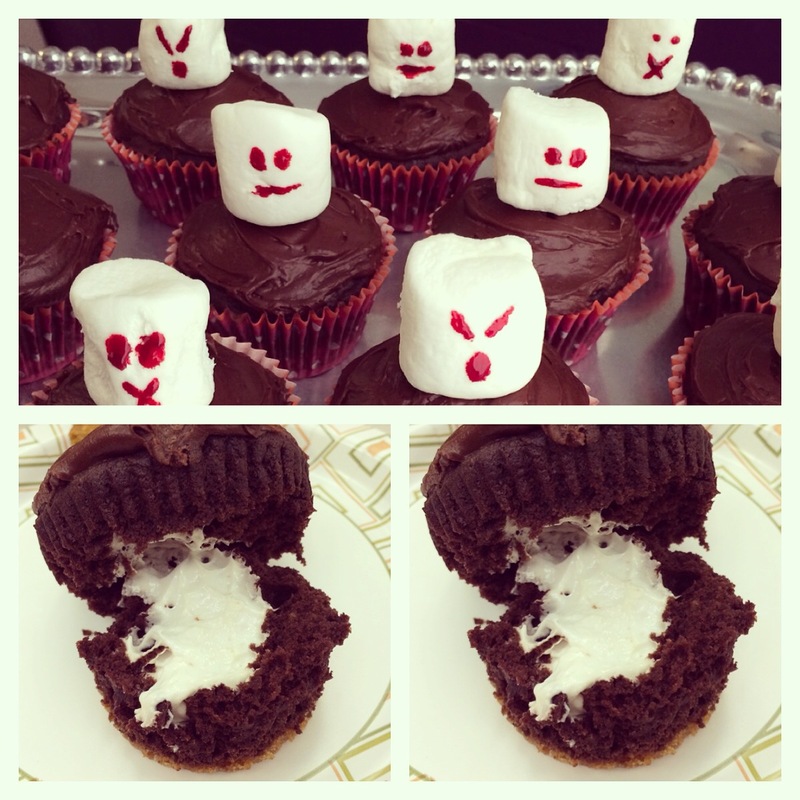 We feasted on chili, slow-roasted pork wrapped in banana leaves, “zombie guts” (cajun sausage), “gall bladder stones” (mini pita pockets filled with pasta, beans, and veggies), spooky s’mores cupcakes, and so much more. I love how creative my coworkers are with their dishes. 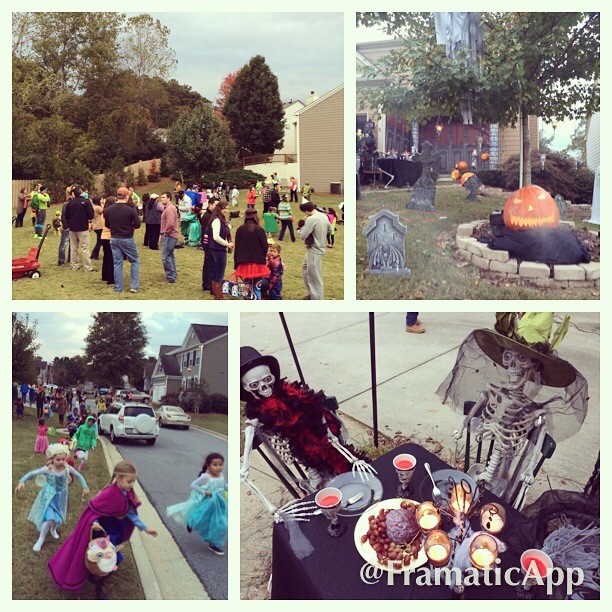 Our neighborhood is the absolute best on Halloween. 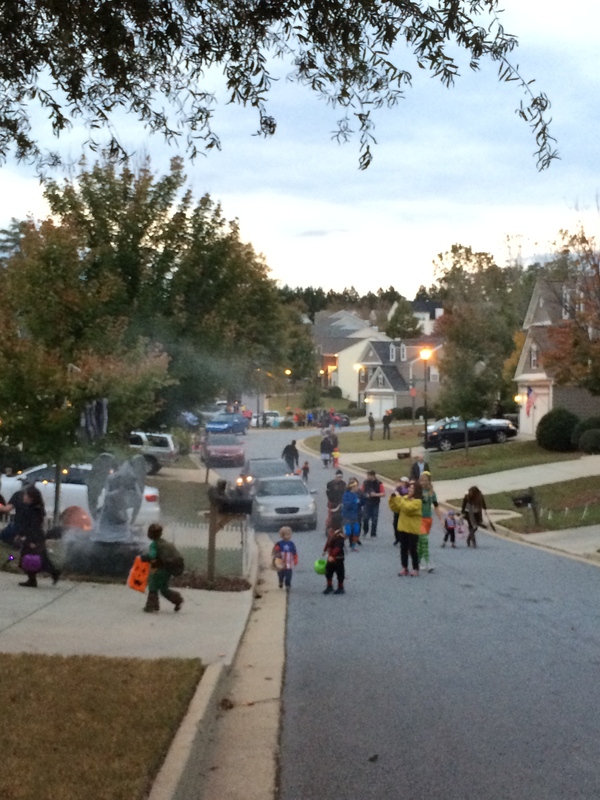 It’s overrun with young children on a daily basis anyway, but I love seeing the streets filled with lots of tiny superheroes, princesses (Elsa this year, obviously), animals, and other funny costumes on 10/31. And the family costumes are even better. 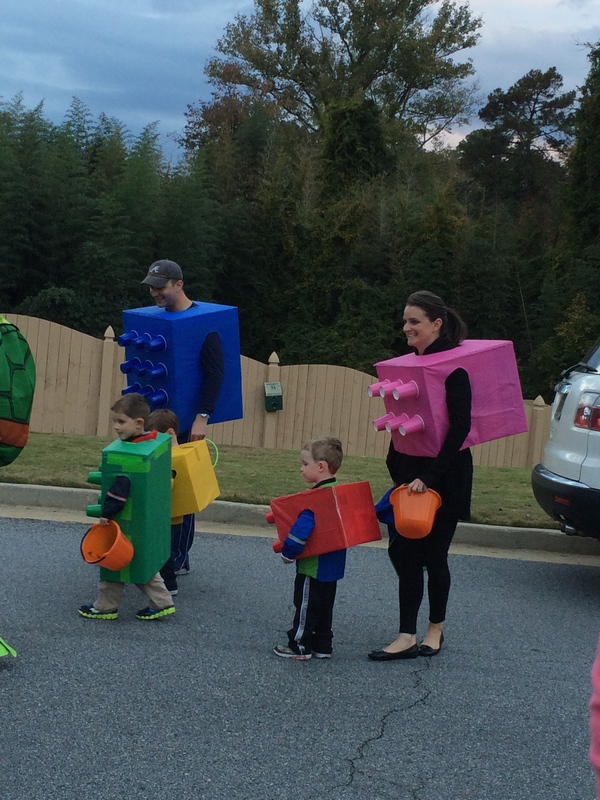 This year, the winner was the family of five Legos — so creative and actually pretty simple to make with cardboard boxes, paper cups, and colored paper or paint. Genius! 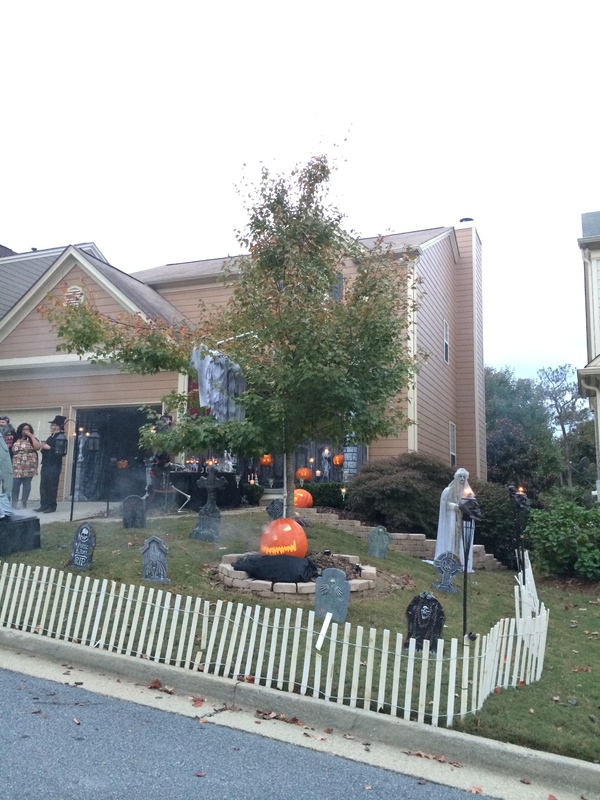 In addition, our next door neighbors go all out with their scary decorations — but they don’t set up until the day of Halloween to make it extra exciting. My absolute favorite detail this year was the table full of fancy skeletons dining on jello brains and drinking witch’s brew. 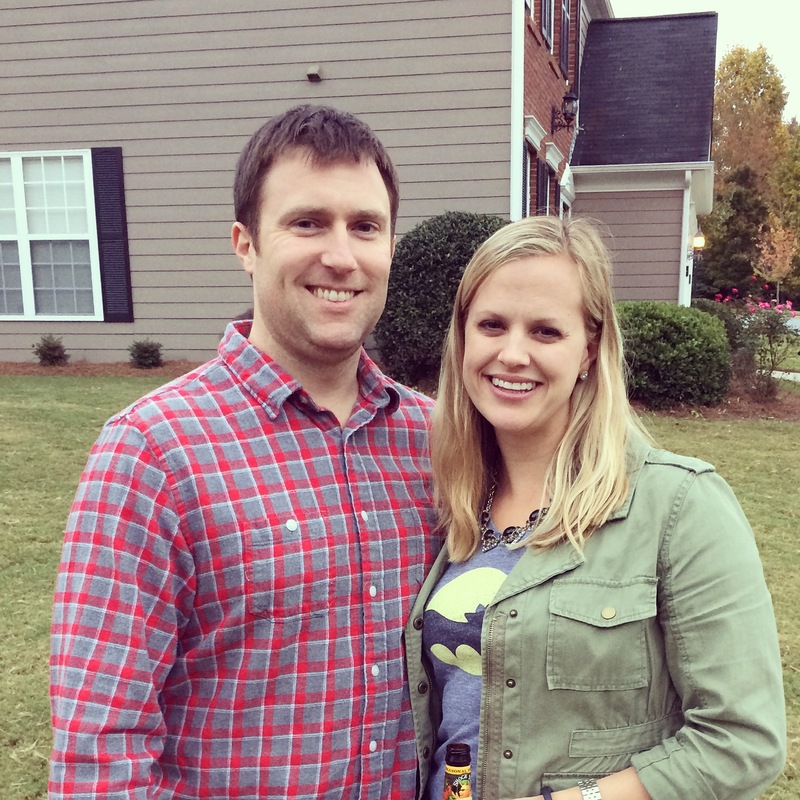 Happy Halloween from the Hayes family!